When she sleeps, she curls up like a cat and could fit on a dinner plate, good enough to eat. 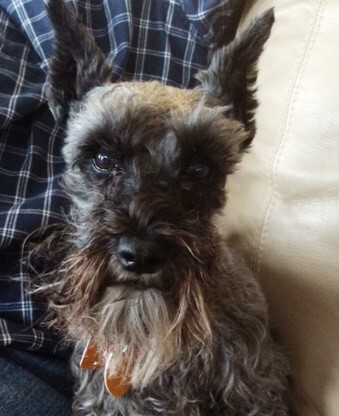 My little runt of the litter is as playful as a puppy (and sometimes as misbehaving as one), but she’s getting to be an old lady like her owner (complete with gray hair and a beard). She turns 8 this month. That’s 56 in dog years, ya know. I can’t remember her exact date of birth, and we don’t celebrate it with anything like dog food cake (blech! 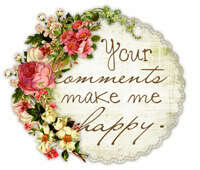 ), but are grateful for her unconditional love and joie de vivre. Happy birthday, little bundle of canine! Today was a day filled with small rock-my-world moments. These moments, if they are real, are the moments between Before and After. Moment No. 1: My beautiful doggy lurched off my Beloved’s lap and stood paralyzed in the middle of the floor, not answering to our pleas of her name. It appeared to be one of those moments of pre-seizure aura, the quiet before the storm of a uncontrolled spasm. Beautiful Chloe experienced a rash of seizures about nine months ago. Since she’s been on Kepra, she’s been seizure-free, but her doggy neurologist demands she be seizure-free for a year before weaning her off the medication. At this point, I just assumed she would continue to be seizure free. Then, her weird behavior this morning. She didn’t have a seizure. But in those few paralyzed moments before she shook it off, I flashed back to those awful seizures last spring. Moment No. 2: After 11 months without my period, Aunt Flo paid me a visit today. Regular readers know I’ve been counting the days until menopause (officially, it requires a year without menses). I have once again escaped entering this new phase of my life. What a surprise! Moment No. 3: The power went out. The whole neighborhood was dark. The uncommitted doomsday prepper in me imagined a world without electricity. Without supermarkets. Without police protection. As I munched on my shrimp salad in the dark (my last opportunity to dine on hot food), the power came back on. I thought the dog was about to have a seizure. Then she wasn’t. I thought I was menopausal. Then I wasn’t. I thought the world might be ending. Then it wasn’t. Today’s rock-my-world moments were false alarms. No need to worry. Just wait it out. These things, too, shall pass. 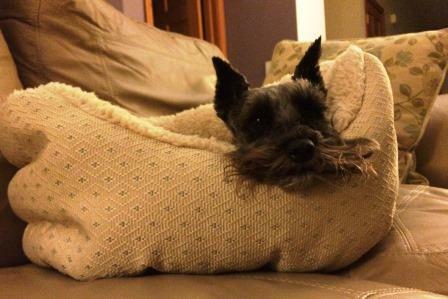 The Bearded Lady, otherwise known as The Princess, aka Chloe, got a new bed today. Why? For some reason, she has no time for the velvet-lined bed we bought to match our living room (yeah, I know, first-world problems). 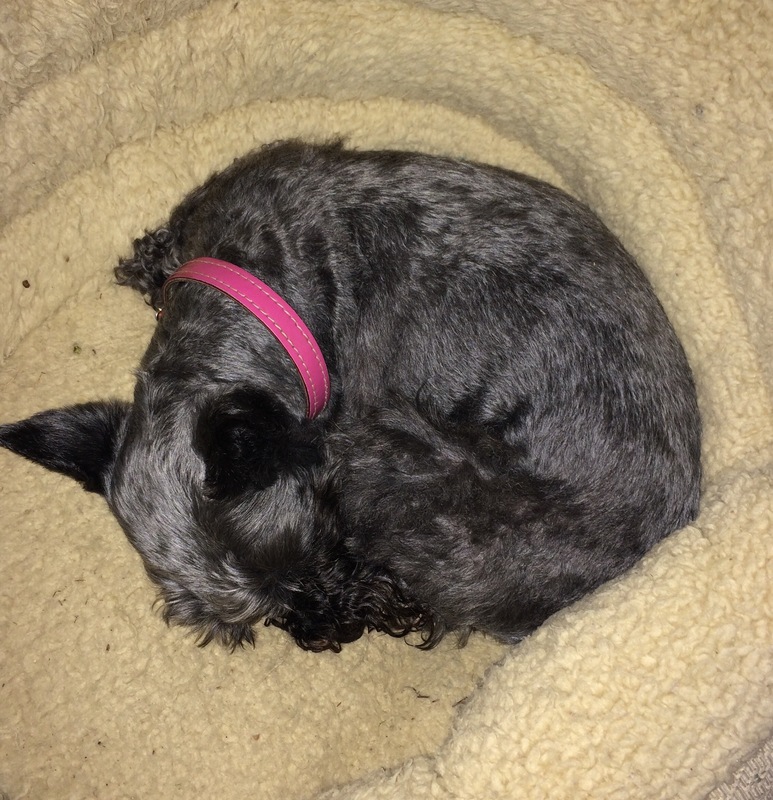 When my Beloved was at Petco picking up Pill Pockets (they’re amazing if your dog takes pills regularly, as our little lady does to treat her epilepsy, but they cost nearly as much as the medicine), he found an alternative bed lined with nubby sheepskin (or a reasonable facsimile). It’s the time of year for nubby sheepskin, you know.